Hundreds of people had a rough Tuesday morning when an MBTA Commuter train experienced a derailment in Belmont, Massachusetts. 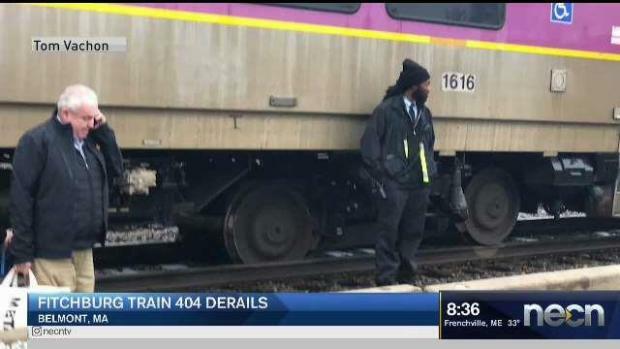 Although service is expected to return to normal by Tuesday's evening commute, a derailed MBTA commuter rail train caused major delays for customers earlier this morning, and an investigation into the derailment is underway. According to Keolis, MBTA Commuter Rail Train 404 on the Fitchburg line was involved in an upright derailment at about 8 a.m. The train, which was carrying approximately 800 passengers at the time, became disabled after stopping near the Waverly Square station in Waltham on Tuesday morning. NBC10 Boston spoke to one commuter named Andy by phone about his experience. "It was like a bump and then it kind of was leaning to one side," he said. "One of the passengers said she thought she saw like a fireball or something." Passengers aboard a Commuter Rail train are experiencing delays after the vehicle derailed in Belmont, Massachusetts. Andy credited a quick-thinking passenger for alerting train crew. "She says, 'I think we just lost the wheel,' and another passenger pulled the emergency brake," Andy recalled. 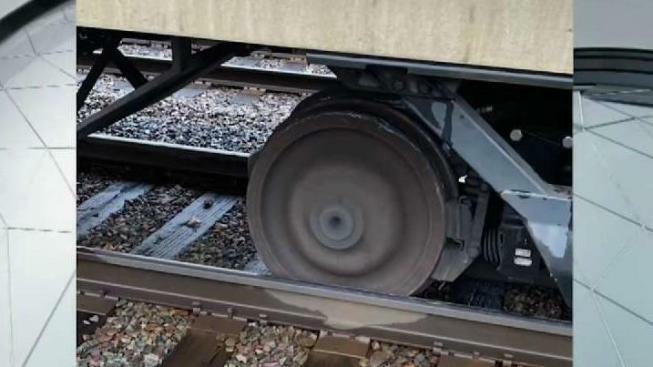 Photos from the scene showed one of the train's wheels was off the tracks and passengers being taken off of the train. After more than a 90-minute wait, Andy and fellow passengers said they were eventually transferred to trains 408 and 492. "It was an absolute joke. They told us they would have another train there in 30 minutes and an hour and a half later they had a train there," Andy said. The issue was initially reported as a mechanical issue by Keolis on social media. The exact cause remains under investigation, and the train itself has since been re-railed and is under inspection. Keolis, the company that manages the MBTA Commuter Rail system, said that all commuter rail coach cars with the same equipment as that of Train 404 in addition to the track where the derailment happened will be inspected ahead of the evening commute. In a statement, MBTA General Manager Luis Manuel Ramirez said the agency's highest prority was safety for its customers and employees. "We appreciate our passengers' patience and cooperation during this incident, and I want to thank our teams for their efforts to restore Commuter Rail to full service," he said in the statement.